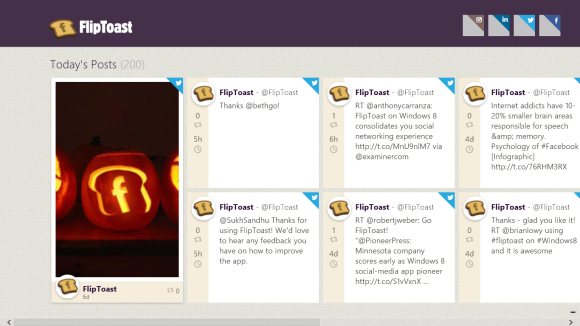 Social media is now embedded in our business workflows, our shopping habits, and our news sources. 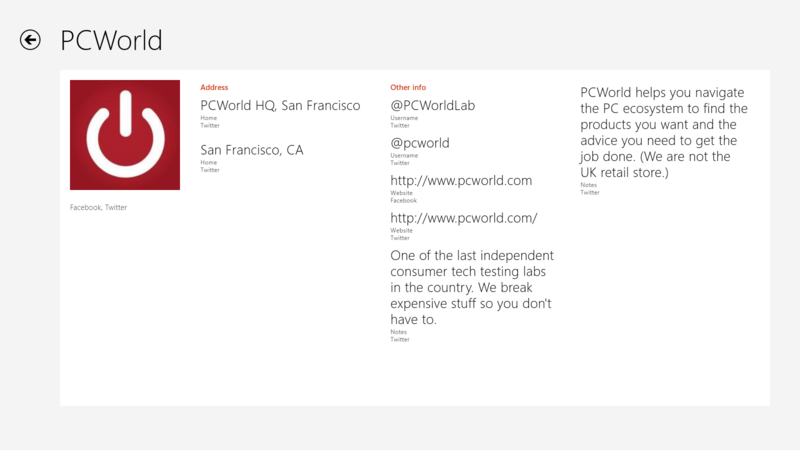 So it’s no wonder that Microsoft infused social media features into its Windows 8 contacts app, People. The message is clear. 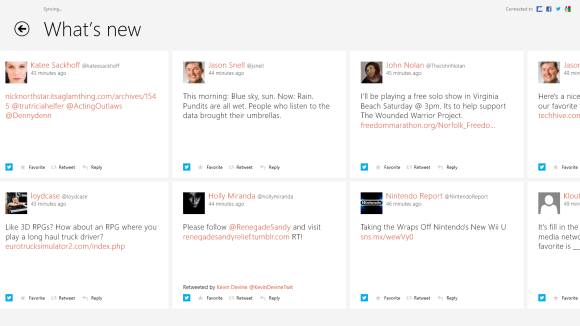 Since social media is omnipresent in our lives, it should be woven throughout Windows 8 as well. But make no mistake: People is a contacts list, first and foremost. Although it does allow you to commingle all of your social media and email associations—including those from Facebook, Google, Hotmail, LinkedIn, Outlook, Twitter, and your Microsoft Account—social media management is not the People app’s main purpose. Let’s say that you use a few different email platforms and a small handful of social media services, and that each platform and service connects you to hundreds of different people. Family and friends are on Facebook, coworkers are on LinkedIn, your favorite celebrities and media personalities are on Twitter, and a good portion of the people mentioned above appear in your various email address books. The People app gathers up all of those associations and sorts them into alphabetical order for your viewing pleasure. Once your contacts are synced, you can favorite or even pin the important people in your life directly to your Start screen for quick access. People works well as a central depository for storing all the bits of information that pertain to your contacts. You can associate email addresses, Twitter handles, websites, phone numbers, addresses, job titles, and companies to each individual entry. You can also use People to quickly open the Messenger app to start a Facebook chat session with a contact, and People hooks into the new Maps app for planning a route to someone’s address. You’ll also find some rudimentary social networking tools within the app that allow you to tweet, retweet, like, or comment on the latest content without having to leave People. People gathers photos from each of your Facebook contacts, too. Just tap a contact’s tile, and if he or she has public-facing Facebook photos, you can see them here—all separated into albums, just as they appear on the actual Facebook page. Scrolling through them is simple, as is viewing or posting comments. Although the People app attempts to provide a semblance of social media interactivity, its features are scant and its interface is difficult to navigate. For example, if you want to see new tweets from all your follows, you have to head to the ‘What’s new’ section. But if you want to post your own tweet, you need to enter the ‘Me’ section, a completely different location. These two basic Twitter features aren’t integrated—and that’s confusing. The app also flouts the familiar “long list of tweets and status updates” format that everyone has come to expect from pretty much every social media app in existence. Instead, it renders individual tweets and status updates inside obnoxiously large tiles that you can’t compress, collapse, or otherwise resize. The layout leaves a lot of dull, blank space all over the page. Traditional social media apps, such as Twitter or Tweetdeck for iOS and Android, offer a compact, list-style view that shows multiple tweets at once. People, in contrast, has room for only six updates on a single piece of screen real estate, so catching up on updates is more trouble than it needs to be. Unfortunately, People doesn’t include features for divvying up your contacts into logical groups. For instance, the ability to separate relatives, coworkers, friends, and casual acquaintances into easily sorted buckets would be helpful. As it stands, the single, unified contacts list becomes unmanageable quickly, and organizing people only by name doesn’t provide enough customization and control. Let’s delve into the settings that you can find within the Charms bar when the People app is active. 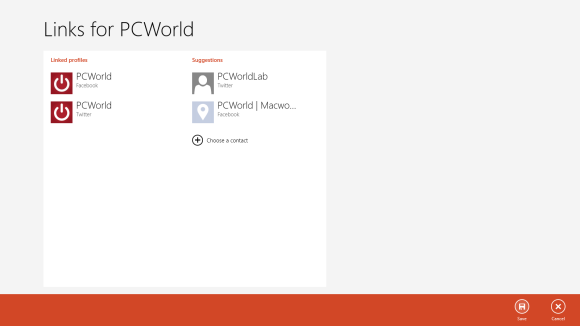 Accounts: Here you can add, manage, and remove the various accounts you’ve linked with your Microsoft account. Note that removing the Microsoft Account will remove all accounts, and People will become unusable until you log in with another Microsoft Account. Under the accounts that are email-related (such as Google, Hotmail, and Outlook), you can set the frequency by which the system will download new mail, and whether to sync email, contacts, the calendar, or all three. Accounts such as Facebook and Twitter need to be managed online through Internet Explorer (you’ll see a link to the correct location). Options: Here you can choose to sort contacts by last name (sorting by first name is the default). You can also elect to filter which of your connected accounts will appear throughout the app’s main areas. If you clear the checkbox next to an account, that account’s contacts will essentially disappear from the master contacts list and ‘What’s new’ feed, but all those people will still show up in search results. The rest of the settings include Help (which takes you to Microsoft’s FAQ page), About (which has technical information about People), Feedback (which allows you to provide feedback on the app), Permissions (which lists the different things you have agreed that People can use), and Rate and Review (which takes you to the Windows Store to review the app). Now let’s look at the main options that are available throughout People; each set of options is contextual, and varies depending on where you are inside the app. Right-clicking or swiping up from the bottom on this page produces the Options bar, with three selections: ‘Home’, ‘Online only’, and ‘New’. ‘Home’ is on every Options bar in People, and will send you back to the Home screen. ‘Online only’ will filter your contacts to show who is currently online (discussed below). 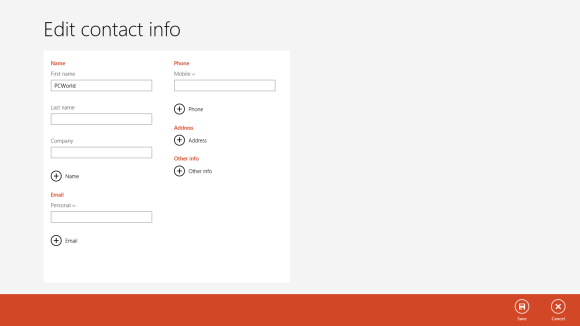 ‘New’ will allow you to create a new contact by defining a person’s name, email address, and the like. The Me page (edited for privacy, of course). Right-clicking or swiping up from here will give you the ‘Edit’ option, which launches Internet Explorer and takes you to your Microsoft Live page to edit your primary Microsoft account. When browsing Photos in your Me screen, you can click on any image to like it or browse and leave comments. Right-clicking or swiping upward will give you the ‘View it on Facebook’ option, which launches you right to the page in a browser. 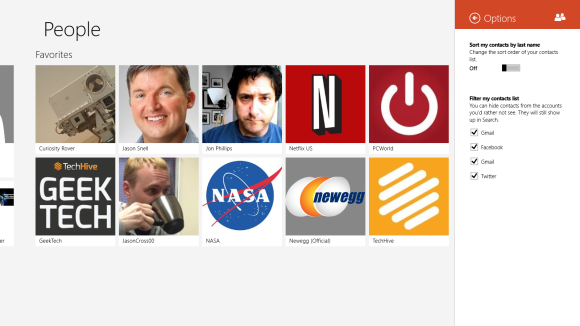 Like many of the option bars throughout Windows 8 apps, this bar also offers a ‘Refresh’ button to refresh the current page. You can select a single post to participate in regular social media activities such as liking, retweeting, commenting, and replying. Right-clicking or swiping up from the bottom on any single post will allow you to refresh the page or view the post on the applicable website. 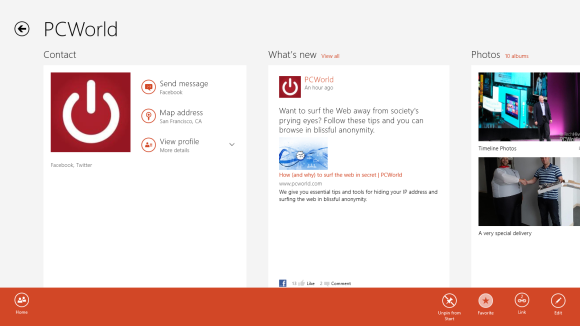 Right-clicking or swiping up on the main ‘What’s new’ page will give you a ‘Refresh’ option as well as a ‘Filter’ option to select which social network to view. Only one social network can be visible at a time, and you have to wait for the page to load completely before looking for this option, or else it may be missing. 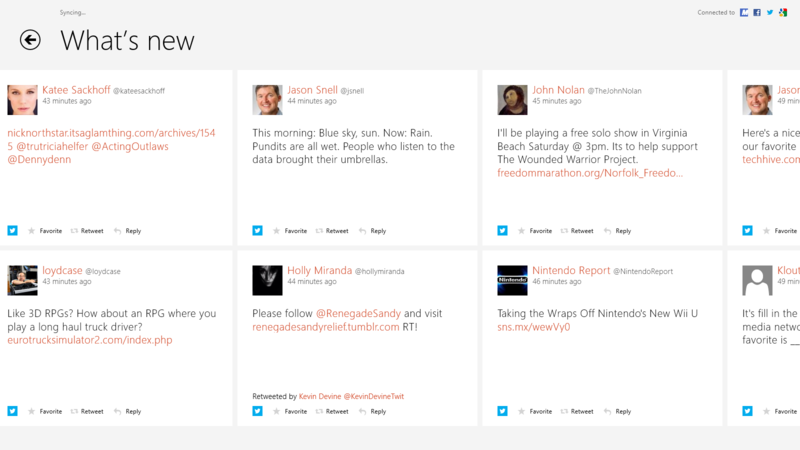 The View details tab shows you a comprehensive overview of saved information. Right-clicking or swiping up from the bottom on this page will reveal ‘Pin to Start’, ‘Favorite’, and ‘Link or Edit’ options. If a number appears in the ‘Link’ button, it refers to how many profiles are currently linked to that contact (as discussed below). ‘Edit’ allows you to adjust and enter any additional information you have on the contact that the social network may not have provided already. Tapping ‘Pin to Start’ will make the contact a tile on your Start screen, while ‘Favorite’ will place that contact front and center in a prominent position on your main People screen. The Edit contact screen allows you to add more information. Opening People for the first time is an underwhelming experience. None of your accounts, other than your Microsoft Account, will be synced, making People a desolate and deserted place. To rectify this, enter Settings in the Charms bar, and add some accounts. The setup isn’t daunting: Just hand over your login information and passwords, and refresh the main page to enjoy synced connections. 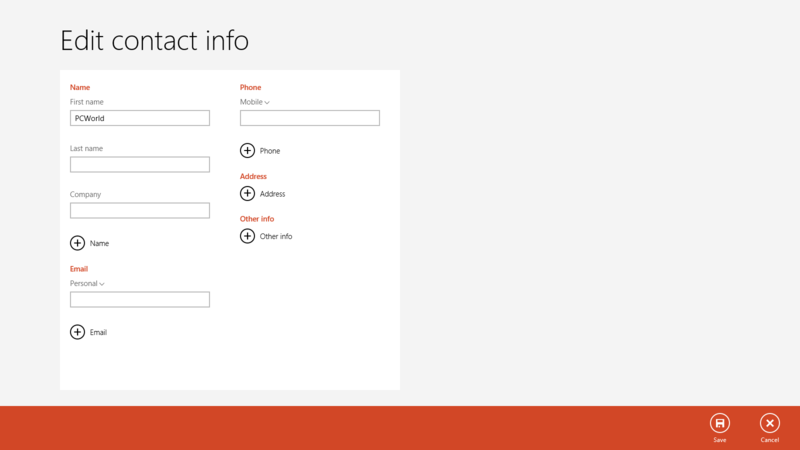 The options for an individual contact. People does a decent job of linking the same contacts from different networks under one profile, but it may miss some duplicates, or you might want to manually link two accounts together. To link two accounts under one, click a contact and swipe up from the bottom or right-click the page. Click the Link button, and you’ll see all the accounts linked to that contact on the left side. If you don’t see the contact you want to link under ‘Suggestions’, click the Choose a contact button, locate the contact, and click Add. Once finished, click the Save button at the bottom-right corner. Both of those contacts will appear under the single name, with the contact you originally started with as the dominant one appearing in the contacts list. Link accounts together to put them under one contact. Although user-interface adjustments in People are severely limited, you do have a way to “zoom out” and parse through contacts by letters of the alphabet instead of scrolling through hundreds of contact names. If your machine has a touchscreen, use a pinching motion with two fingers on the home screen—this action will activate the “semantic zoom” feature for that bird’s-eye, alphabetic view. If you’re using a mouse and keyboard, you can activate semantic zoom with the scrollwheel on your mouse. If you need to search for a specific contact, use the Search function in the Charms bar. 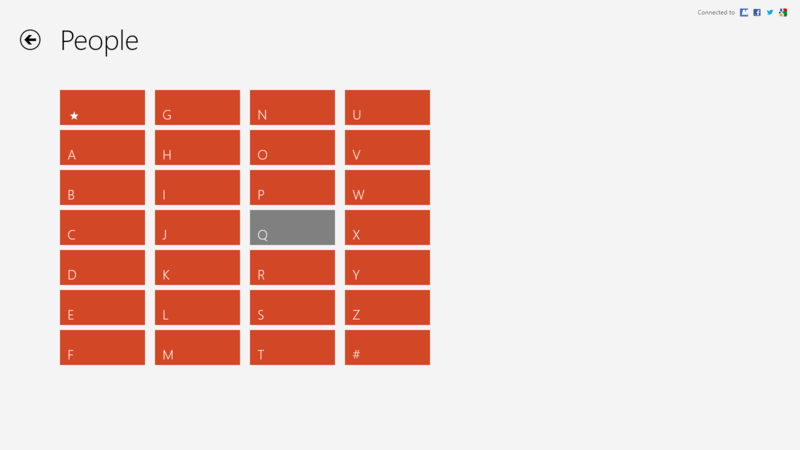 Zoom out to jump to a letter. You may see a thin green strip next to a contact’s profile picture. This indicates that the person is currently online, and most likely available for instant messaging. If you would like to see everyone who is online, swipe up from the bottom or right-click on People’s home screen. Click the Online only button, and everyone who is offline will be filtered out of the contacts list. We recently posted an article with 11 replacements for Microsoft’s standard apps. If People isn’t living up to your social media standards, take a look at FlipToast, which gathers Facebook, Twitter, LinkedIn, and even Instagram under one comprehensive app. Right from the first screen, you get areas for the most recent posts, notifications, photos, messages, upcoming birthdays, and friends.